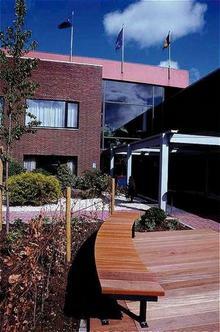 The Leonardo hotel Namur is situated along the Meuse River at 8 km from Namur. The hotel is in a beautiful valley in the Belgian Ardens 15 mi from the E411 motorway and 25 mi from the E42 motorway. The hotel is a conference center with 25 conference rooms from 2 till 375 persons. The meetings rooms are fully equipped with screen- flipchart- ADSL- Wifi. Our conference team could also organize you an tailor made event with team building- cultural event and big party in or outside the hotel. We are at your disposal to organize your event like you dream it Our 110 rooms are cozy with the garden or river view. Our restaurant open for lunch and dinner invite you for a delightful moment. Our bar with the terrace on the river is open from 3 pm till midnight. During the summer take a barbecue on our terrace viewing the Meuse River.Would you like to visit the surrounding easily Just rent a bike at the reception desk. Leonardo hotel Namur offer you a great time of fun with his swimming pool in and outdoor and a sauna. The children may also use our playground in the garden. In the area you may visit a lot of castle- abbey and test all our delicious beer. The citadel of Namur invite you to a trip in the history. The Leonardo Hotel may provide you all the information you need to take advantage of our beautiful country.